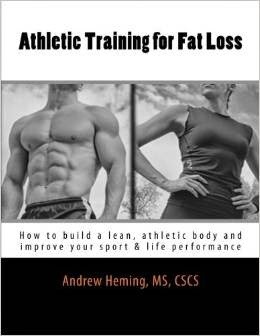 Andrew Heming's Blog: Can You Really Lose Fat and Gain Muscle at the Same Time? What would your ideal (but still realistic) body look like? For many people, this would require both losing fat and building muscle. This leaves you with a very important question – can you do both of these at the same time? I’ve often joked that to lose fat while building muscle is the holy grail of training. But is it possible? Can you really burn fat and build muscle at the same time? Let’s look at what the latest research has to say on this topic. Recently, a study was done at McMaster University to investigate this. To read more about this study, click HERE. For this study, 40 young men were divided into 2 groups. Each group was fed for 4 weeks (wow that would have been expensive!). The diet had 40% less calories than the subjects required. One group was given a high protein intake (2.4g/kg or about a gram per pound of body weight) or a low protein group (1.2g/kg or 0.54g per pound of body weight). Both groups did a very intense training program consisting of 4 days a week of intense strength training with hard compound movements and 2 days a week of high intensity interval training. Low protein group lost on 7.7lbs of fat and hardly any muscle. The high protein group lost 10lbs and actually gained 2 pounds of muscle. While 4 weeks is not that long, there were some impressive changes for the length of the study. The cool thing with this study is that they trained the guys for 4 weeks AND fed them. This gives the researchers total control over nutrition – which is a key variable in fat loss and muscle gain. Often studies like this simply instruct the subject to continue eating their normal diet which leaves room for error. It is important to note that all the subjects were very hungry during this 4 week period. While the results were fast and impressive, it is definitely not a sustainable approach to combine this style of training with such a low-calorie diet. Fat loss requires a caloric deficit. This means that your daily calorie burn needs to exceed your daily caloric intake. While proper training for fat loss is fantastic, your number one priority is nutrition. The most important thing for muscle gain is an intense training stress. Your body is designed for survival. If it needs to build muscle to survive, it will. However, if you are trying to build muscle, you want to be thriving, not just surviving. For optimal muscle building, you want intense training and a caloric surplus. Who is most likely to gain muscle and lose fat at the same time? Focus on one major goal at a time. Yes, in this study the subjects technically lost fat and gained muscle. However, on average there was 10lbs of fat loss, but only 2 pounds of muscle gained. This is more of simply a very good fat loss program than a cut and bulk program. If you are not sure whether you should lose fat or gain muscle first, focus on losing fat first. Many people look more muscular when they are leaner as less body fat allows the muscle you do have to be more easily seen. Your body is healthier and more responsive to gaining muscle when you are leaner. Related: Should You Bulk or Cut First? However, if you are focusing on fat loss, don’t give your body the option of losing muscle. Use intense weight training with big, hard, compound movements, high intensity interval training and provide your body with a good amount of quality protein. As with the research, this can provide you with effective fat loss while eat least maintaining if not gaining some lean muscle. How about you? Have you ever gained muscle and lost fat at the same time? I invite you to leave your questions and comments below or on my Facebook page.